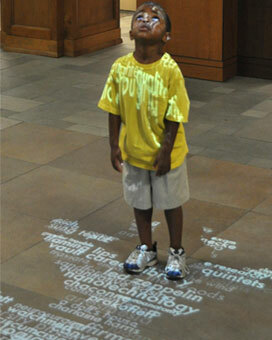 Visitors passing through the entrance of the Central Library are greeted by WordsWorth: a stream of light projected on the lobby floor that displays patterns symbolic to Vanderbilt. The elements comprising these patterns are actual words and terms used by students and faculty in their online research and harvested in real time from the library search engines. WordsWorth is responsive to every movement — stepping through the stream of light causes the elements to scatter. When the visitor passes beyond the range of WordsWorth the scattered words slowly return to one of three iconic patterns. 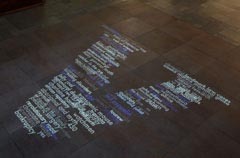 As new searches occur the words projected on the floor change to reflect what the campus community is researching at that moment in time. Caroline Hart, Founder’s Medalist for the Blair School of Music, graduated with a Bachelor of Music in Violin Performance in 2012. Winner of numerous awards and scholarships including the Vanderbilt Orchestra Concerto Competition, performing passages from the opening movement of Tchaikovsky’s Violin Concerto, op. 35. While a student, Caroline worked at the Central Library. On her last evening with the library, she was inspired to perform this piece with WordsWorth. She graciously agreed to return to have the interaction captured on this video. 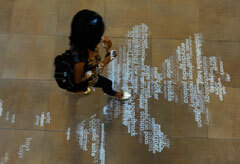 “WordsWorth scatters research terms much like leaves on a forest floor as visitors cross our lobby. From physicians doing cancer research to a first year undergraduate beginning a new assignment, the projection exhibit represents the university’s research in shapes we associate with Vanderbilt and it affirms today’s libraries are welcoming, high tech and stimulating places to be,” noted Connie Vinita Dowell, Dean of Libraries. WordsWorth dynamically illuminates the range and depth of scholarship on Vanderbilt’s campus in a way that no static art work or graph can achieve. It symbolizes the university’s remarkable research enterprise and the central role of information technology in modern libraries. Library visitors participated in naming the exhibit. From more than one hundred recommendations suggested by the campus community, Richard McCarty, Provost and Vice Chancellor for Academic Affairs, selected WordsWorth — a clever nod to Great Britain’s famous English Romantic poet William Wordsworth who lived from 1770 to 1850. WordsWorth was developed during a $6 million renovation and restoration of the Central Library complex that created an innovative set of interactive exhibits as well as two projection exhibits. This project was part of a renovation and restoration of more than 30,000 square feet on four floors of the 70-year-old library building. The plans were designed by Nashville architects Gilbert McLaughlin Casella. 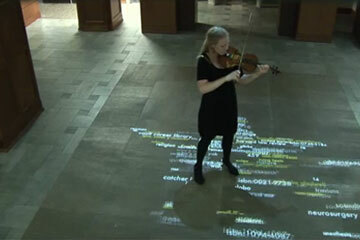 WordsWorth generates a data cloud from words and phrases entered into the library search engines and projects it onto the floor of the library where it interacts with the movement of people passing through.